Marvellous work as always, I'm still hoping it'll work on an X68000, not likely! Anyway, here's a issue I've been thinking about. You know how when going through the gate to the second stage the times tend to be the same, e.g. 58'25 or 59'21 and so on. How does it get these numbers, simply by rounding? How close are they to the actual time the player did the stage in etc.? As an aside, I just got a Super Hang-On PCB and noticed that it saves the high-scores. Does it use the same principle as your new code for Out Run? I think an X68000 port from this work is unlikely! That would be more of a rewrite. I've seen that, yes, thanks. What I mean is: let's say you go through the gate in 58'49. Does this get rounded down to 58'25 or rounded up to 59'21 for the purpose of displaying it? We can only dream some maniac will take on the task. I think that answers your question as to why you'd see similar values if I understand correctly? Magic Knight: I can answer your question about the individual stage times. I believe there is a bug in the original code that causes lap times to be displayed incorrectly. The value for seconds is accurate, but the hundredths of a second is not, as it appears to be mistakenly taken from the current lap instead of the lap just completed. You can verify this in MAME by pressing "P" to pause the game a few car lengths before the checkpoint, and then holding down the SHIFT key and pressing "P" repeatedly to advance one frame at a time. On the frame where the lap time first appears, you'll notice that the hundredths of a second matches the time for the "just started" stage (ex: 57.25 and 00.25). This behavior is consistently observed 100% of the time. I'd not noticed that before. I'm on a work trip this week, but once I'm home I'll look into this further - the code will reveal the answers. I can potentially fix the bug on both the original game, and the remake. Thank you both gentlemen! I've been testing both the Japanese early release (outrundx in MAME) and the later western releases. Going left I consistently get 59'25 and going right 59'21. If I get under 59 seconds going right it's 58'25 that I'm credited with. I have both the old Japanese version PCB and Rev A, and they display the same times as in MAME. I'm sure a look at the code will reveal all. It's not a big deal or anything, but I was always curious as to why the time given never varies. I looked into the lap timer bug. The same routine is used by the timer in the top right and the extend time routine. The routine takes the stage number, and looks up the appropriate time (minutes and seconds) from memory. However, it uses a cached millisecond value converted by an early routine. Therefore, the millisecond value is indeed shared by mistake. That's great, nice to get confirmation on what stella_blue said. As you say, it should be an easy fix on your new version. I don't suppose it's too big a deal on the existing version, but it's interesting to know. Yes, I'm pleased that my observations are supported by the underlying code. I've been chasing the Twin Galaxies MAME record on this title for several months now, and my pursuit has involved a fair amount of frame-by-frame analysis of the various stages. I have a number of other questions, comments and observations related to this game. Given that it may be a lengthy post, should I attach my comments here, or would an email message be more suitable? E-mail them over (use the address in the following url: http://javagear.co.uk/images/email.png) - I can always answer them in a separate blog post if they will prove useful to others. Do you think that an Amiga 1200 AGA port would be possible? Think about it, the Amiga port was terrible and should have been better but would it be possible in 320*256 in 256 colours without too much colour reduction. A 68020 at 14MHz with 2Mb is no match for 2x68000s at 12.5MHz + 1 Z80. Is there a clean separation of the rendering code and game code? Also compressing it to fit on one floppy would be a challenge. A decent conversion would be possible - a direct port not so likely. 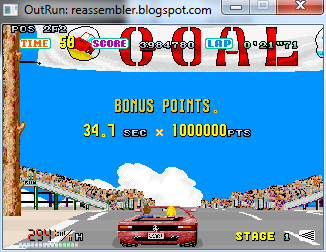 By the time you added the overhead of emulating the OutRun road rendering hardware in software on the A1200, other optimisations would be needed. The A1200 does have hardware sprite scaling I believe, so that would help considerably with other areas of the video emulation. Using the original code and graphics would yield better results than the original port in the hands of a capable programmer. Not sure if the floppy issue would be the real challenge? You could just split over a couple of disks and load into RAM.